Better questions, no easy answers. Living into life, not escaping it. Click, tap, or scroll for more information. For more events in the coming weeks and months, click or tap here. Holy Week begins with Maundy Thursday on April 18. Services are at 1:00 PM & 6:30 PM. We continue Holy week with Good Friday worship service on April 19 at 6:30 PM. Join us for the Resurrection of our Lord on Easter Sunday, April 21. Services are at 8:30 AM & 11:00 AM. Easter Breakfast will begin after our 8:30 AM worship service, around 10:00 AM. We are looking for hot or cold dishes to serve for our Easter Breakfast between services. No sign up necessary! Simply bring whatever you want. For hot dishes, please bring them with you already warm. We don’t have the ability to heat anything on Easter Sunday morning. Mark Edwards and Pastor Tim continue their Adult Forum: "How to be a practicing Christian when I am not always a believing one" on Sunday, April 28 between services. Mark Edwards and Pastor Tim will pose questions and offer background, but the adult forum will depend largely on candid and considerate conversation among the participants. If you are visiting for the first time or you are not a regular church-goer, this short guide is for you. Worship at Holy Trinity follows a traditional pattern that dates from the early church. It involves the whole person in the "worship of the people" (the "liturgy"). There is singing and responsive readings, prayers and greetings, candles and colorful pastoral garb, sitting and standing, words about the Word and an open invitation to the Lord's Supper, offerings and closing exhortations to go forth and serve the world. Don't worry if this may be new to you. We all use a printed Worship Booklet to guide us through the service, and other worshipers will happily help the newcomer. A large-print version of the Worship Booklet is also available. Just ask the usher. Can I learn more about the Lutheran liturgy? People of every walk of life are part of our community and our attire reflects that. Come as you are. You will see people in jeans, dresses, suits, shorts, high heels and flip-flops. Following the worship service we assemble in the Gathering area for coffee, light treats, and fellowship. Please join us! If you bring a child to worship at Holy Trinity, feel free to relax! We believe that God gave children the wiggles when God made them, and it’s ok for them to wiggle during worship. We have a children’s sermon each week during worship to engage children in the stories of the Bible in a way that they can understand. We have three worship tables in our sanctuary for children to use. Each table has a Children's Bulletin. Your family is welcome to sit near one, and your children can worship while they color and create artwork to decorate our sanctuary. 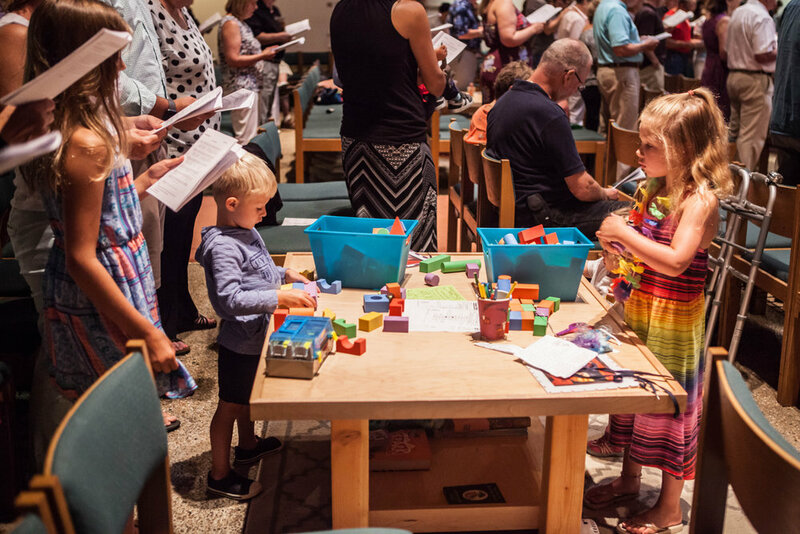 Children of all ages are welcome in our worship service, but for those who wish it, a staffed nursery is provided for children up to age 5 and located down the hallways to the left of the kitchen. How do we at Holy Trinity engage children, youth and families in a life of faith?